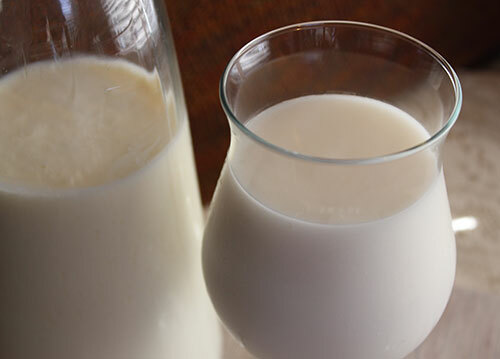 Milk kefir is a thick, yogurt-like cultured drink traditionally made from dairy milk, but can also be made from coconut milk or assorted nut milk varieties. It is a sour, yet refreshing, fermented food inoculated with valuable bacteria and yeast that break down the lactose in milk, or other sugars found in vegan milks, into lactic acid and propionic acid. 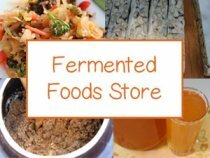 As it ferments, it develops a complex matrix of beneficial microorganisms that can greatly improve the health of the colon and entire gastrointestinal tract as well as boost immune functions. In essence, drinking this cultured beverage provides natural probiotic properties that can be extremely helpful for reestablishing healthy gut flora. Regular or periodic consumption is known to coat the lining of the digestive tract and intestines where these beneficial bacteria can further incubate and colonize. Drinking a glass in the morning on an empty stomach is especially recommended for those who have a past history of antibiotic use as these drugs tend to kill all friendly microflora in the body, leaving the yeast strains to dominate. 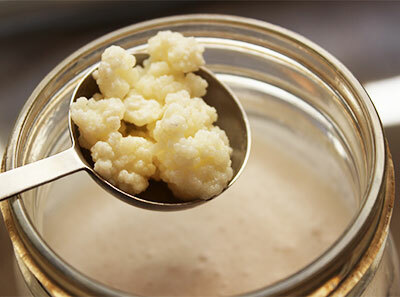 In the words of Donna Gates: "Kefir has tremendous healing power. With its laxative effect it helps clean the colon. Its beneficial bacteria and yeast help control the pathogenic yeast and repopulate the colon with a favorable, new life force." 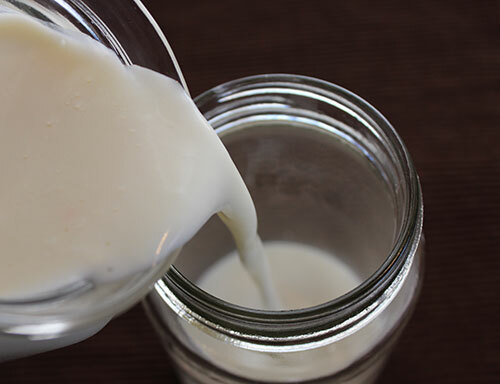 It is easy to make homemade kefir as it essentially only takes 2 ingredients, milk and your grains and/or starter. Typically you would use about 1T grains or starter to 1 quart of water. The process from start to finish is about 24 hours to get a perfectly tangy gelatinized dairy or vegan milk drink. 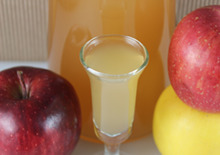 These versions are always best over commercial varieties that have to comply within certain guidelines for selling a fermented beverage and may produce an inferior product. 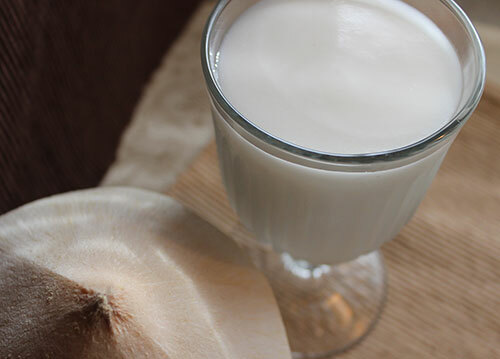 Learn how to make our creamy-style coconut kefir recipe here. 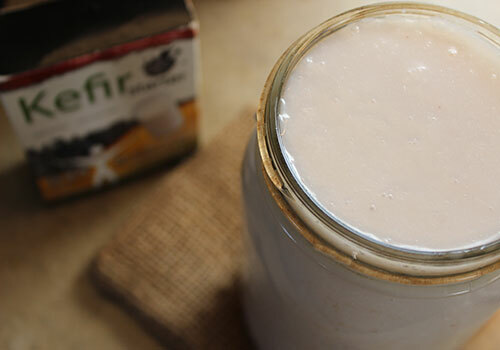 Kefir, pronounced "kee-fir", is traditionally made from cow or goats milk but one of the advantages of making your own homemade-style is that you can use vegan milk options instead of consuming animal products. A thick creamy kefir can be achieved by using a combination of coconut meat and er as well as homemade nut milk blends, like almond milk. 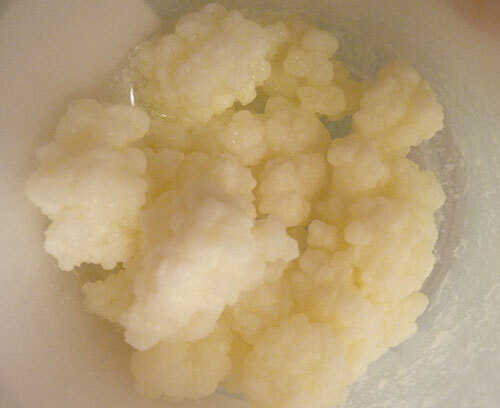 Kefir is not yogurt, and although they are both cultured, each contain entirely different types of beneficial bacteria. The process of making yogurt uses primarily Streptococcus thermophilus and Lactobacillus bulgaricus starter strains, while kefir grains are known to contain many different strains of Lactobacillus, Leuconostoc, Pseudomonas, Acetobacter and Streptococcus as well as numerous types of yeast species including Saccharomyces, Kluyveromyces, Torula and Kazachstania. More therapeutically nourishing than yogurt, the microbial activity in kefir can actually colonize the intestinal tract while yogurt acts more like a prebiotic feeding any friendly flora that may be present. The use of kefir is thought to have originated from Russian descent but there is some contrary information to this theory. 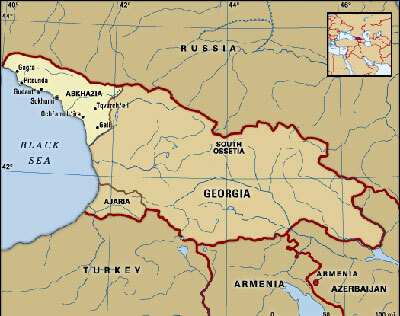 It is known to have come from somewhere in the Caucasus Mountain region, specifically Armenia, Georgia, Turkey and Iran, where it has thrived as a sacred cultured food for centuries. In the Turkish language the word "kefir" is derived from the word "keif", which means "to feel good." Traditionally prepared by culturing goat or sheep milk and fermented in hide-skin bags, kefir was customarily hung by a doorway as the bag could be knocked by those passing, which helped to continually mix the grains with the milk. As legends speaks, the first original grains are said to have been passed down from the prophet Muhammad and held in high regard as a sacred food to be shared only with close friends and family members, passed down through the generations. In the late 1800's, which is when the word "kefir" first existed in the Russian language, a Caucasus prince was tricked into giving the grain starter to a seductive Russian female acquaintance who then took them back to her country as a cherished drink that still exists today throughout that region. The "tara" grains of the Tibetan peoples, almost identical to kefir grains, have provided them with a similar fermented drink for centuries. According to kefir expert Dominic Anfiteatro, "Each and every batch of kefir grains in existence today, trace back to a region of the Caucasus Mountains - all kefir grains found anywhere today, originate from that place and are the children of the very first natural mother-culture that mysteriously developed in a particular region of the Caucasus Mountains." To ferment milk, nut milk or to make a coconut kefir recipe, you need a kefir culture starter, which comes in the form of a powder or in the form of a grain. 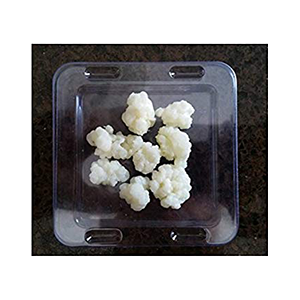 The grain is not really a "grain", but a rubbery, cauliflower-like mass that continues to grow the more you use it. This is the traditional culture used to ferment the milk and some people, like fermentation expert Sandor Katz, believe is the only way to make "true kefir" because of the complex array of microflora that is provided. Grains are made up of proteins, lipids, and sugars, but most significantly a polysaccharide called kefiran, which is the substance that gelatinizes the milk and makes it thick and creamy. 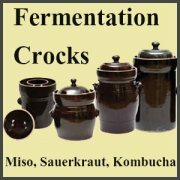 Sometimes called a "scoby", like the kombucha mushroom, it is essentially a combination of lactic acid bacteria and yeasts growing on a rubbery-textured substrate. During the fermentation process, the lactose and other sugars are broken down by lactic acid bacteria into lactic acid, of which small amounts are further broken down into propionic acid by propionibacterium. Many people who are, in fact, "lactose intolerant" can usually digest this cultured form of dairy because it pre-digests the lactose component. In one published study in the Journal of the American Dietetic Association it was identified that, "Because kefir improved lactose digestion and tolerance, its use may be another potential strategy for overcoming lactose intolerance." Does Kefir Contain Alcohol Content? If fermented beyond one day, especially when carbonated with a lid on for a few hours after the initial process of fermentation, it can develop a bubbly effervescent that may contain between .08 to 2% alcohol. It is often referred to as the "champagne" of milks for this reason. Longer ferments tend to break down lactose into ethanol and carbon dioxide, so if your kefir is particularly fizzy it might have greater amounts of alcohol than you may desire. This may be of importance to recovering alcoholics or those who wish to abstain from even minute amounts of alcohol. Because the grains grow in size the more you use them, if you are an avid kefir maker, over time you will end up with a lot to share with family and friends. They tend to develop best in dairy milk rather than vegan milks. This means that if you make them with vegan milks, every so often you should allow them to ferment in cow or goat's milk to keep them alive and well. If you intend to drink dairy kefir, we recommend choosing a high quality raw organic milk over pasteurized varieties that are far less nutritious. The grains themselves are quite amazing as they are potentially immortal substances that when fed and kept healthy will never die. We have grains that are over 10 years old as they keep reproducing and rejuvenating the more you use them. Some people think you need to keep them in constant use in order to preserve them for long periods of time. But as the original owner of GEM Cultures explained to us once, they can be dried off with a towel and stored in a small container, that is double wrapped, in the freezer when not in use. When you want to prepare kefir simply thaw them overnight and you can drop them into your jar of milk the next morning. We have frozen the grains and thawed them for reuse many times with great success. We would recommend, however, using them for about a month or longer before refreezing them again, just to make sure they are healthy, strong and flourishing. They also supposedly can be dried and reconstituted, but we have not directly experienced this preservation technique. The evolved life-form that makes up the actual grain biomass contains a complexity of beneficial microorganisms that can not be duplicated in a laboratory, although many have tried. 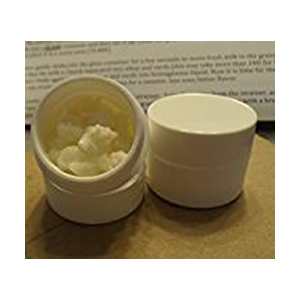 The closest thing to a lab produced starter culture comes in the form of a powder, created using only a few of the original species that can be grown without a mother-culture. The argument against these starters is that they only have a limited amount of microorganisms, consisting mostly of strains of Lactococcus, Leuconostoc mesenteroides, Lactobacillus kefyr and Saccaromyces unisporus. 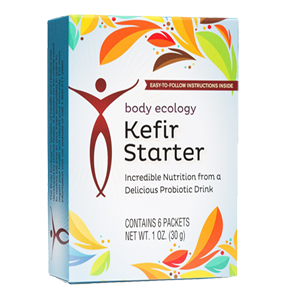 So although this starter powder is a more convenient option over trying to maintain the life of your kefir grains, it is known to contain far less variety of probiotic organisms in the final product. It is not considered a "true kefir" in a sense because of these characteristics. 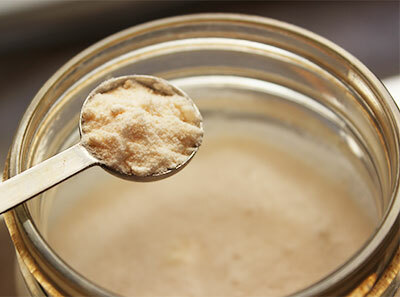 Health authorities, like Donna Gates, argue that the powder is actually created with hardier strains and that the Lactobacillus in grain cultures over time can start to crowd out other yeast and bacteria, so you may end up with something different than you started with. This theory however has never been scientifically proven. For those of you dedicated to ongoing homemade kefir making, we recommend trying both kefir grains as well as a powdered starter mix, like the one from Body Ecology. When using only powdered culture it is also possible to make a new batch without adding additional powder, but by using 6T of the previous batch. Grains however, as mentioned, can be stored for later use. 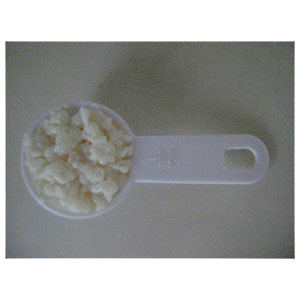 Milk grains are used exclusively for milk, which includes fat and protein content. They are opaque with an off-white color. Water grains are somewhat translucent with a different texture than milk grains. 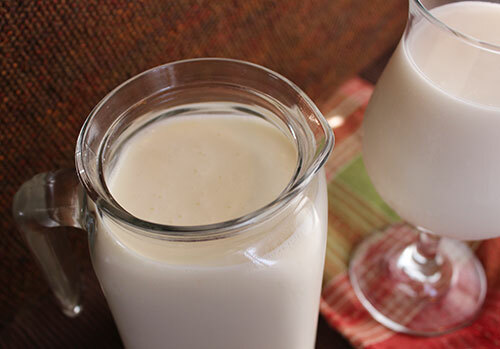 Learn more on the differences between milk kefir and water kefir. 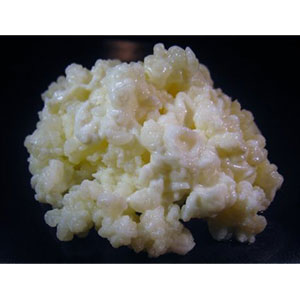 Water kefir grains, also called "tibicos", are made up of the polysaccharide called dextran and are used exclusively to ferment coconut water or any kind of sugar water or fruit juice. Tibicos does not have the same origins as the milk grains and many different strains are used all over the world to produce various cultured drinks. Many people are now into making water kefirs these days, as they do not involve dairy or heavier nut based milks and are significantly lower in calories than milk based versions. Variations like coconut water kefir are most ideal for those with candida overgrowth or those who wish to reduce the amount of calories they are consuming throughout the day. Water kefir is made in the same way that you make milk kefir and requires about 48 hours to ferment. The Body Ecology Kefir Starter powder is used to make both milk kefir in addition to sugar water-based varieties and can be used interchangeably. 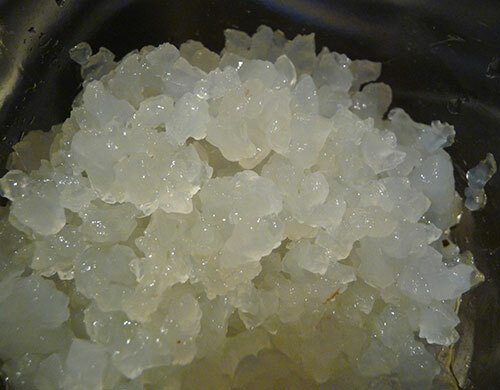 Water kefir grains or tibicos, however, can't be used to make milk-based kefir. Most health experts agree that a healthy balance of gut flora, or also called gut microbiota, in the digestive tract and specifically the intestines is extremely important for maintaining the health of the entire body, organs and systems. When this equilibrium is achieved, these microbiota can properly perform their task at regulating the metabolism, producing and synthesizing various hormones, vitamins and minerals, digesting waste material, preventing the growth of harmful pathogens and sustaining immune functions. However, when the "unfriendly" microorganisms take over we become more susceptible to disease and yeast infections. One of the leading causes of this type of overgrowth is the ever so common use of antibiotics (against-life) which kill the friendly bacteria and cause the fungal group to dominate. This condition can cause a host of symptoms including frequent headaches, flu's, cloudy thinking, food allergies, rashes and potentially more serious health problems further down the road. 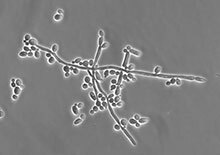 In addition, fungal yeast overgrowth's can also occur from the frequent consumption of low quality foods, stress, diabetes as well as a number of prescribed medications. Because gut flora is fed through dietary intake, eating foods that promote a balanced microbial environment can be extremely helpful for overall health and enhanced immunity. 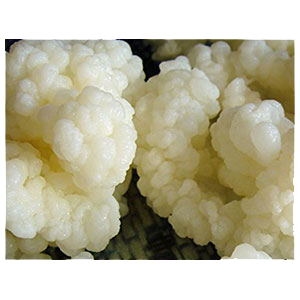 Kefir is a delicious living drink, nutritionally enriched with these beneficial microbes. As a liquid cultured food, it contains billions of probiotic (pro-life) organisms that can proliferate and promote a healthier "inner body ecology." Moreover, kefir is an alkaline-forming beverage that helps to nourish and provide a gentle coating of "good mucus" on the interior lining of the digestive tract. This can be very beneficial when taking probiotic supplements because it increases their effectiveness as a favorable environment has already been established. 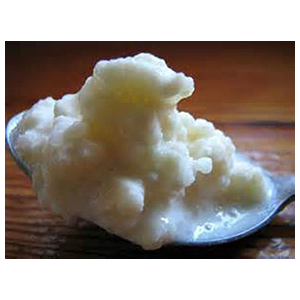 As with other enzymatically active fermented foods, like miso and sauerkraut, kefir naturally improves digestive functions by helping to break down undigested waste material in the gastrointestinal tract. This process has a laxative effect on the bowels and can help to prevent constipation and encourage regular bowel movements. One of the great benefits of culturing foods is that the nutrients, like proteins, vitamins and minerals, contained within them are pre-digested in the process, making them more bioavailable when consumed. The nutritional composition found in most kefir's is largely dependent on what type of milk is used. When dairy-based, they are especially rich in tryptophan which works with the kefir-abundant minerals calcium and magnesium to relax and calm the nerves. Tryptophan also converts into the neurotransmitter serotonin, which is extremely beneficial for elevating mood and getting a good nights sleep. Milk, as well as other vegan-based kefir's, additionally help to provide vitamin K and B vitamins like folic acid, thiamin and biotin. Appropriate absorption of vitamin K and B vitamins are fundamentally reliant on sufficient levels of friendly flora in the intestines. Biotin is a necessary component for the synthesis of essential fatty acids, protein and other B vitamins, such as B12. Biotin is produced by healthy intestinal bacteria and usually absent in people with candida overgrowth. Foods like kefir can significantly help to increase uptake of these nutrients. 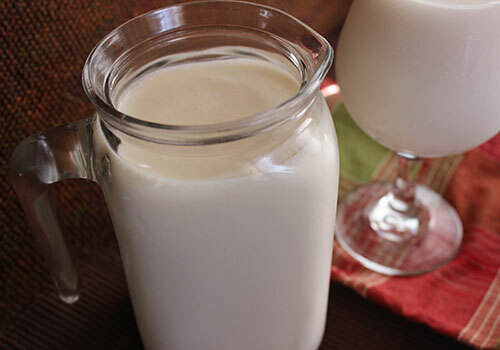 Raw milk and other vegan homemade grain-based kefir's are known to contain vitamin B12. 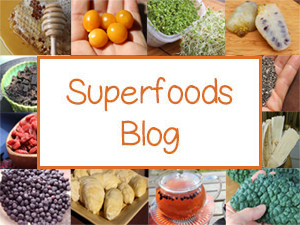 B12 comes from bacteria or molds. 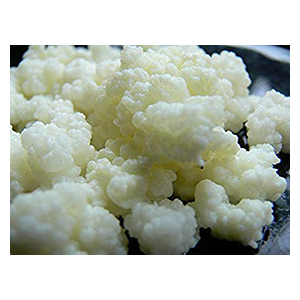 Therefore, the grains used to make kefir, containing specific propionic acid bacteria helpful for B12 production, can provide for increased amounts of B12 in your final ferment. 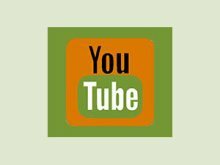 But, because amounts may vary it should not be used exclusively as a supplemental source by those following a vegan diet. Vitamin B12 is an essential nutritional component for normal brain and nervous system function as well as blood cell formation. It is best to consume kefir on an empty stomach first thing in the morning, especially if you have major health challenges. It is also helpful to add probiotic supplement powders at the same time to increase uptake potential. Depending on your unique situation different varieties of kefir may be more appropriate over others. 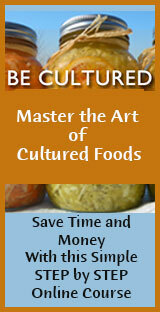 The basic option of which would include using raw milk, vegan milk or water-based kefir's. You can also add small amounts to protein shakes or green smoothies for additional probiotic effects.